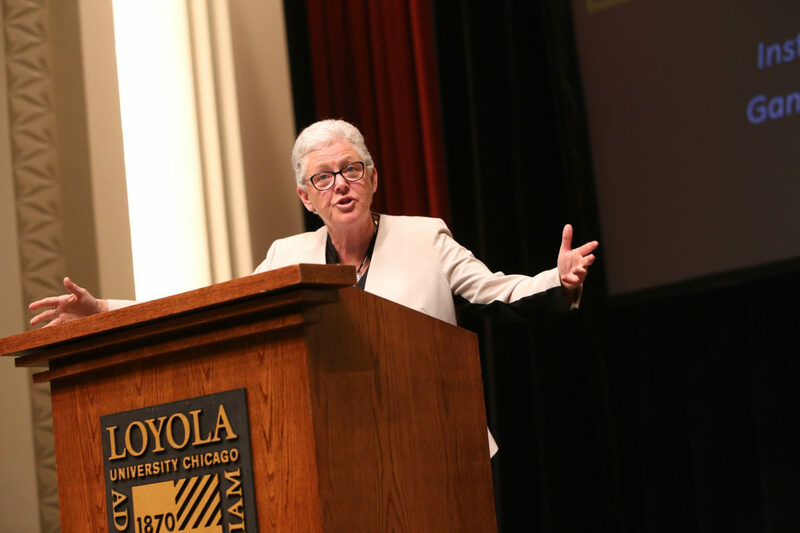 Former head of the U.S. Environmental Protection Agency (EPA) Gina McCarthy encouraged students to remain hopeful about environmental issues in her keynote address at Loyola’s annual Climate Change Conference March 15. Held in Mundelein Auditorium, this keynote address was the first of many events for Loyola’s fifth annual Climate Change Conference, with panel discussions and student poster presentations March 16. This year’s theme was Climate Change and Human Health: 21st Century Challenges. McCarthy, who headed the EPA under former President Barack Obama, is a senior fellow at the Harvard Institute of Politics, and serves as a senior leadership fellow at the Harvard T.H. Chan School of Public Health. McCarthy, who was invited to speak by the Institute of Environmental Sustainability (IES) and Gannon Center for Women in Leadership, addressed her worries about the EPA under President Donald Trump’s administration, and her distaste for the defunding of the EPA, an administration she believes has benefited people for many years. “I worry about [the] EPA. I worry about an agency that has had 47 years of tremendous success, all of a sudden being looked at as a threat instead of as a protector, which essentially what [the] EPA is,” McCarthy said. Since Trump has taken office, the EPA has been anticipating changes to environmental policy under current director Scott Pruitt. Possible changes include alterations to Obama-era policies on limiting climate change and reducing pollution, as well as cutting federal costs for science and environmental efforts. “I do feel like it’s not just [the] EPA but science in general is under threat, which is perhaps even more disturbing in many ways, and there are many threats to our democracy itself,” McCarthy said. However, McCarthy said she has hope for the planet and for the EPA through action and advocacy. “I will not give up; we are not going down. We need to take a nice big breath of fresh air, thank [the] EPA for [the fresh air] and remember that [policies to help climate change are] going to continue, because we live in a democracy and they work for us, not the other way around,” McCarthy said. Loyola President Jo Ann Rooney and founding dean of the IES Nancy Tuchman spoke ahead of McCarthy and mentioned Loyola’s efforts to remain sustainable. Rooney spoke about some of the prominent issues surrounding climate change and the environment, and mentioned a handful of natural disasters that made landfall in the United States in 2017, many of which affected various members of the Loyola community. She acknowledged the public health issues that have resulted from these disasters. “Climate change is a human rights issue, a public health issue and a national security issue. These major climate events and their collateral impact have left countless human health emergencies in their wake,” Rooney said. Tuchman expressed the importance of an interdisciplinary approach in taking action. She introduced the Chamber Choir, a choral group at Loyola, and the dance program. Both groups collaborated on a Native American song accompanied by dancing. “We recognize the power of an interdisciplinary approach to climate solutions, and this annual conference draws on expertise and participation from disciplines across our university,” Tuchman said. In 2016, Loyola was named the seventh greenest university in the country, according to the university website. Additionally, seven university buildings are Leadership in Energy and Environmental Design (LEED) certified, meaning they have been certified as environmentally positive by the U.S. Green Building Council. Since former university president Michael Garanzini, S.J. signed the American College and University Presidents’ Climate commitment in 2012, Loyola has worked toward sustainability by creating policies, constructing LEED buildings and installing renewable energy sources. Loyola aims to be officially carbon neutral by 2025. 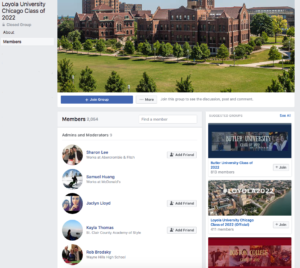 “Loyola University Chicago has been and continues to protect our local environment, but while at the same time, inspiring and enabling our students to serve and protect the environment globally, not just locally,” Rooney said. “She mentioned the word ‘hopeful’ so many times, and I think this is something we are very hopeful of, to see that there are people that are withdrawn from the current administration, but they are still giving their best efforts to make a difference,” Aref said. While many community members attended the event, McCarthy took a specific interest in the students at the event. “I came here to make sure that people, especially young people, don’t disengage from these issues and give up just because there are things happening in Washington [D.C.] that seem to deny climate change and be rolling back core environmental standards that we have relied on,” McCarthy said. Along with many other students, sophomore Isabelle Abbott said she was inspired by McCarthy’s devotion to environmental protection. Alyssa Gurgoni, a first-year undecided major, said climate change influences many different aspects of society beyond the environment. McCarthy acknowledged the impact citizens can have on issues such as climate change and her push for continuous advocacy through a difficult political climate.